Foreigners in the lands of the High Clans. Vassals, serfs, lepers, madmen. The Low Clans have always done the tasks that their lords disdained. But in the wake of the War of Princes, the fallen Cainites question the Divine Right by which the High Clans rule. The low-blooded have seen the world from the underside and they are quite willing to share their revelations. 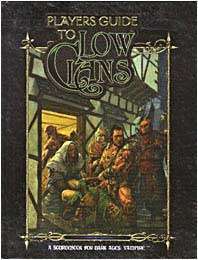 The Players Guide to Low Clans contains detailed information on the Assamites, Followers of Set, Gangrel, Malkavians, Nosferatu, Ravnos, and Tremere. It includes hints on running all Low Clan or mixed chronicles; how Low Clan characters develop over time; the mythology and history of the clans; and new Merits, Flaws, and Discipline techniques for the fallen. Also, you'll find details on Low Clan secret societies and on the Low Clan Cainites who have drawn notice in the Dark Medieval.